Hurt less at work: discover the best set-up for your office environment and establish more dynamic habits for better health. No matter how much money you spend on ergonomic furniture & equipment, even when selected mindfully and installed competently, you still need to integrate yourself enthusiastically to take advantage of the opportunity your new environment offers you. You need to identify the opportunities littered throughout the day from waking to retiring that invite you to move, frequently, and offset the sedentary lifestyle that UK culture promotes and leaves few workers unscathed. You need to learn, experience and then use postures and frequent repositioning that your body expects and requires to be healthy and work effectively. Not everyone has the confidence but you also need to challenge the office/work norms that would keep you STILL, and ironically reduce your efficiency and creativity at work. You do not have to be in pain before making some changes. 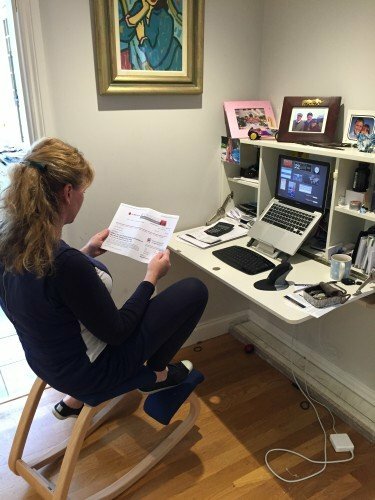 We have physiotherapists, like Lucy and Regan, who are specifically skilled to assess your workstation set, make recommendations for simple positional changes or communicate with your HR department to make more fundamental changes to chairs and desks. You could also have a session with movement specialist Jonathan Lewis to show you creative movement on and around your existing set up that can not only transform your working day but benefit your health and performance across the board. keyboards, footrests, monitor arms, lighting etc) to equip our ergonomic with an excellent selection of products. Call 02076272308 to book an appointment.